I’ve been away from the blog the last few weeks (my apologies) while working on revisions for a book that will come in 2018 — my first hardcover! The good news is all this hard work will be worth it, I think. I already love this story so much more now than I did when I turned it in to my editor the first time. The bad news is, I’ve let some other things go, like the care and feeding of the blog. Sorry. But I do have some book recommendations for you today that will hopefully make up for it. A long while back I read Alice Hoffman‘s TURTLE MOON. 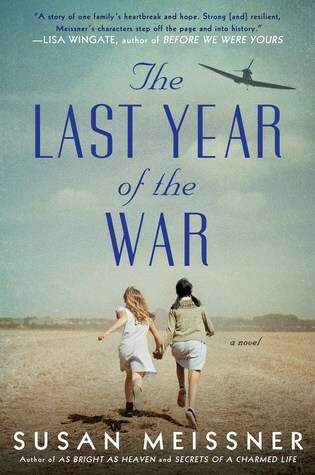 It was the first novel I’d ever read told in the present tense and I remember loving it. Then life got busy and for whatever reason, I failed to read Alice’s next offerings to the literary world. That was a huge mistake. I’ve since rediscovered this immensely gifted writer and now I know I missed out on a lot of good reads since Turtle Moon. Suffice it to say I have some catching up to do. One of the great things about modern technology is the ability to have a book read to you while you drive. I don’t have much of a work commute. (I walk from the upstairs to the downstairs) but I spend a surprisingly ample amount of time in my car anyway. Errands, visits to book clubs, shopping, weekend stuff, visits to the grandlad in Orange County. All of that time behind the wheel adds up. 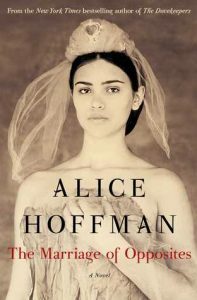 I checked out from my library Alice’s THE MARRIAGE OF OPPOSITES for a drive up to Los Angeles back in December and loved loved loved it. The narration was exquisite and I actually found myself wanting to drive back to LA to keep listening to it. When I finished with MARRIAGE, I next checked out THE MUSEUM OF EXTRAORDINARY THINGS and was again spellbound. Both books are so amazingly well written and full of rich layers of characterization. I highly recommend them both. And if you’ve never tried an audio book before, I’d say start with these. I plan to get on board with Audible sometime this year, although I do like patronizing my local library’s audiobook shelves. 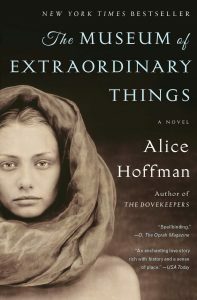 One more thing about Alice Hoffman’s novels. My meter for adult language and bedroom stuff probably leans toward a more moderately modest setting and I am happy to say Hoffman is careful here. She manages to write stunningly real and relevant prose without excess adult language and bedroom situations. You don’t miss it if you’re used to it, and you don’t notice the absence of over-the-top profanity and etcerera until you read perhaps another book where highly adult language and etcetera seems to appear on every page. I love that about her storytelling. 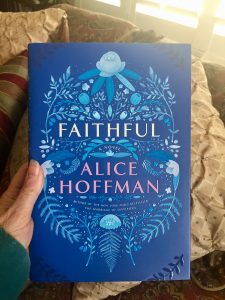 I recently had the opportunity to hear Alice Hoffman speak about her latest book, FAITHFUL, which is on my nightstand now, and I’m so ready to read it when I’ve got these edits done. If you’ve been reading Alice, I’d love to hear your thoughts on her style and storytelling goddessness! And I promise to better at feeding the blog in 2017! Ever since I listened to Kate Atkinson’s LIFE AFTER LIFE on a long road trip with my husband, I’ve been itching to devour more books on audio. I can’t believe it’s taken me this long to realize how a good book on audio can revolutionize the way I look at driving up to Los Angeles or going anywhere during rush hour here in San Diego — both of which I used to dread. With a good audio book in the car with me, I — dare I say it? — I almost look forward to bumper-to-bumper traffic because it means more time with the book. I could bring the book inside in the house with me, of course, but I purposely don’t. I always have a pages book on my nightstand that I am in the midst of reading, so the audio book is for the car and only the car. It’s my own personal quirky rule. But it makes driving fun instead of a chore. 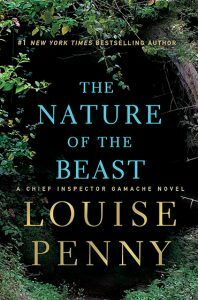 At the library a couple weeks ago I saw that Louise Penny’s newest, THE NATURE OF THE BEAST, was available to check out on audio, and having never read one of her novels before but having heard of her, I decided to give the Canadian mystery writer a go. I listened to my first Inspector Gamache tale and was instantly hooked, just like I was back in high school a million years ago with Hercule Poirot and Miss Marple. And since THE NATURE OF THE BEAST is the 11th in the Inspector Gamache novels, I know I have some serious catching up to do. The audio version is wonderfully narrated by Robert Bathurst (whom you might remember on Downton Abbey as the man who abandoned poor Lady Edith at the altar). With a cast of characters as broad as this one with male and female, young and old, I was amazed at how adept Mr. Bathurst was at keeping the voices distinct and yet not overdone. The audio version contains a message from Ms. Penny about this being Mr. Bathurst’s debut as narrator for an Inspector Gamache mystery, after the untimely death of the originator, Ralph Cosham. The story is set in the quaint village of Three Pines, just outside Quebec, here an ensemble of secondary characters make you wish it was real and you could stay at the B & B and eat at the bistro and sit on the village green with Armand Gamache and Reine-Marie. There’s a murder, of course, to set things off — every mystery has one of those — but the story feels very much character-driven, even though most murder mysteries are steered by the plot. I can’t wait to back up and start at the beginning with Inspector Gamache with STILL LIFE, hopefully on audio, so I can “meet” dear Ralph Cosham myself. But I will definitely look forward to future Gamaches from Robert Bathurst. 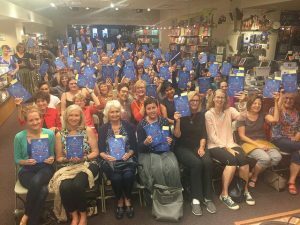 One of the great things about having different platforms on which to enjoy a book is that you don’t have to necessarily be sitting down in an armchair with a cuppa to read it – although few activities are more enjoyable than that. With an audio version of a book, you can enjoy a novel from the comfort of your car while on your morning or evening commute, or while you are jogging, or while you are waiting for something to start and it’s going to be awhile. I love having my novels available to you on audio files. For some of you busy people, it’s often the only way you can get a book a “read.” For those with vision limitations it IS the only way you’ll get a book read unless someone reads it to you. 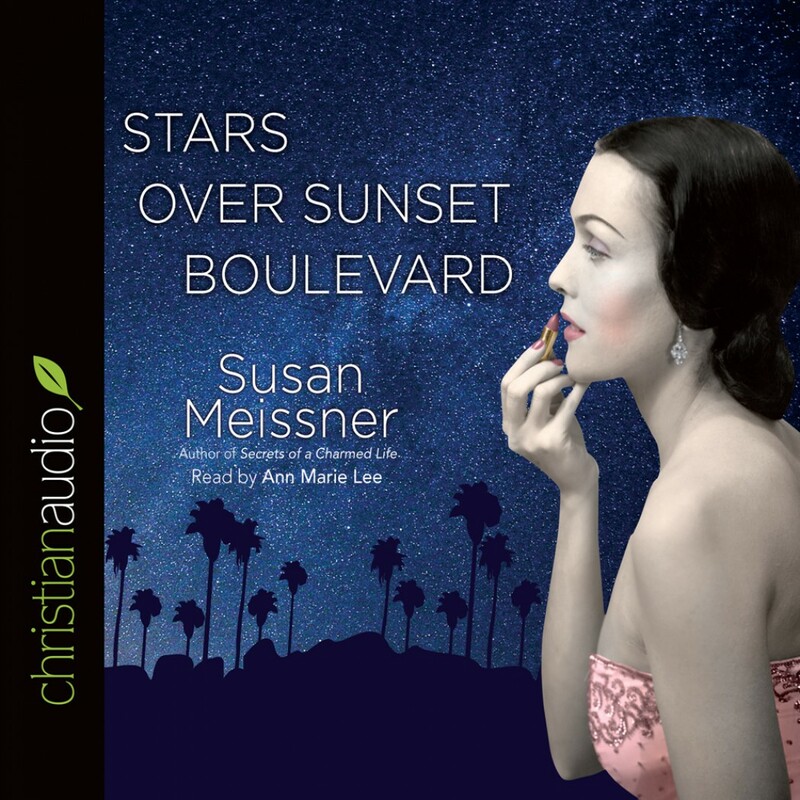 With that in mind, I am happy to announce I’ve got giveaway coupons for five individual downloads of STARS OVER SUNSET BOULEVARD, courtesy of my audio publisher, Christian Audio. 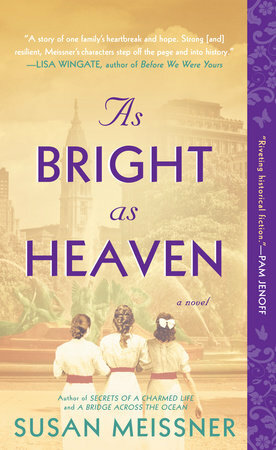 Christian Audio’s got a classy and delish cover for the audio version and I’m thrilled that they contract with the best narrators out there. If you end up being a winner all you will have to do is go to christianaudio.com, add STARS OVER SUNSET BOULEVARD to your cart and checkout with the coupon code. To get in on the drawing, just type in a comment below. Any comment will do. Tell a joke, tell me your favorite old Hollywood movie, tell me your dog’s name. Just tell me something and you’re in. Five code winners will be drawn at random after 5 p.m. PST on Saturday, March 26. You can win the coupon code and give it someone else, say a visually impaired friend or someone who spends a lot of time on the road. As always, thanks for stopping by and good luck!